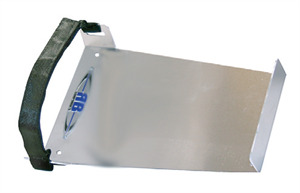 A FAST CLEAN way to store your Wide Nose Wheel Aluminum Jack. Tough Aluminum construction with a Universal Velcro Strap to hold your Jack in place on your Pit Cart, Mule or in the Trailer. Easy To Install.